CRUISE DAY 2: We've been on this FABULOUS ship for just 24 short hours and I'm already IN LOVE with cruising! Today is one of our "at sea" days (we arrive in Santorini, Greece tomorrow...eeek! ), so D and I are going to spend the day exploring the ship, drinking Mai Tai's, and lounging by the pool with a bunch of rowdy 50-something-year-old cruisers we met at the Sunset Bar last night. Holy cow...early retirement makes old people awesome! Ahem, retract that last statement. My mom might kill me for that one. 50 is not old. Far from it. That was just the Mai Tai's talking! ;) Anywho, I'm wasting precious tanning time. Expat Bonnie here knows a thing or two about living far from home, and she's got some wonderful tips for finding happiness in your current surroundings to share with you today. I'm keeping a few of those tips in my own back pocket! Off you go, Bonnie! 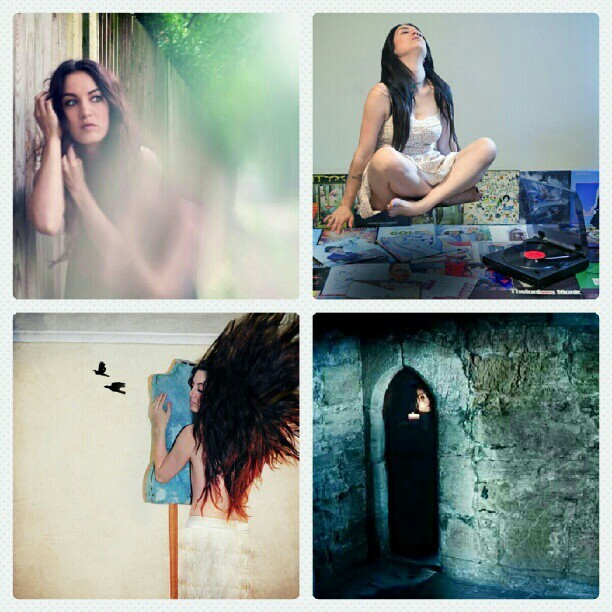 My name is Bonnie Rose and I blog at A Compass Rose. 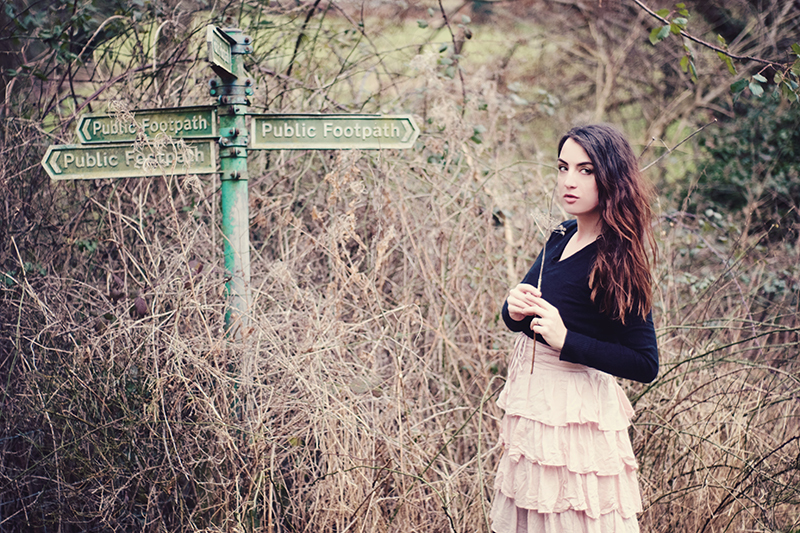 I chose my blog name to reflect myself and my nomadic journey. I was born in England to American parents and grew up moving around military bases in Europe until I was seventeen years old. I am now thirty years old and I have yet to ever live in one place for more than three years at a time. 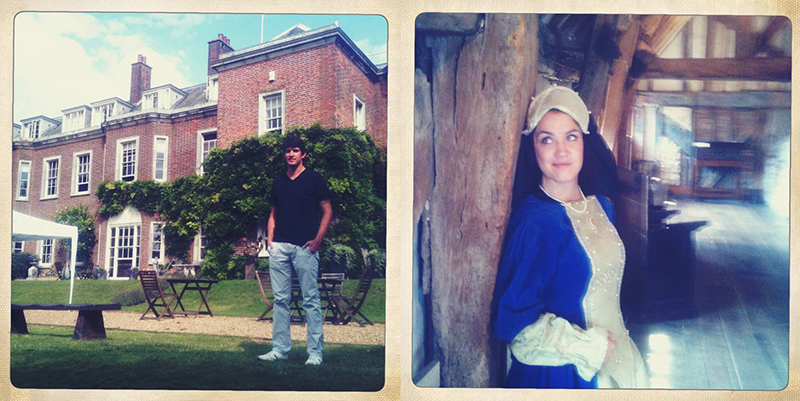 For the last two years I have been living the expat life with my family in England. 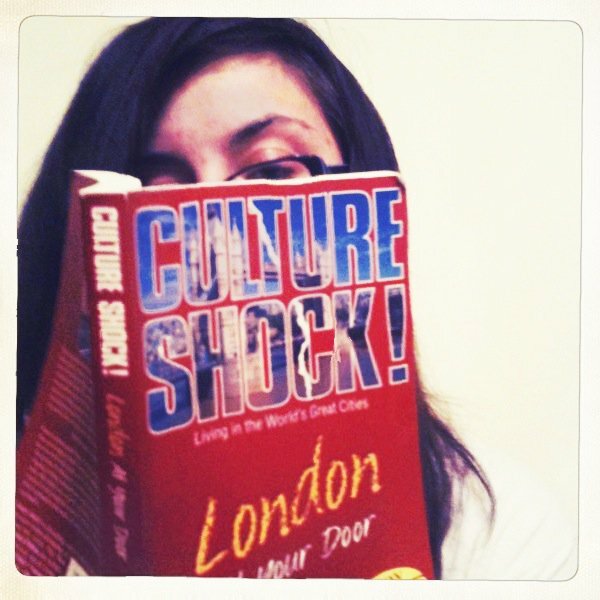 I am a Third Culture Kid (TCK), a military brat (and former military wife), an expat, and a global nomad. I chose the quote above, a line from Chocolat, because it has always struck a chord with me. I am always moving to a place, moving away from a place, or off on a trip exploring new lands. I have been asked frequently if I can ever find peace in one place without having to move again. To be honest I do not know the truth to that question. I have said recently on my blog that I am the most content now in my life in England than I have been since we moved to the US in 2000. However I have moved four times since relocating to England in 2011 and have only been in our current city since this past Christmas. The metaphor of a north wind calling me to new places is quite the reality in my personal story. Whether you are a fellow nomad like myself or find yourself in a new land (currently or in your future) the urge to go somewhere else may arise. For some this could be due to culture shock and wanting to return 'home'. Perhaps you have never moved outside your city but from reading travel blogs are aching to go abroad. Whatever your reason may be for feeling restless I have compiled a list of ways to find contentment in your current location when the practicality of moving is not your best option. 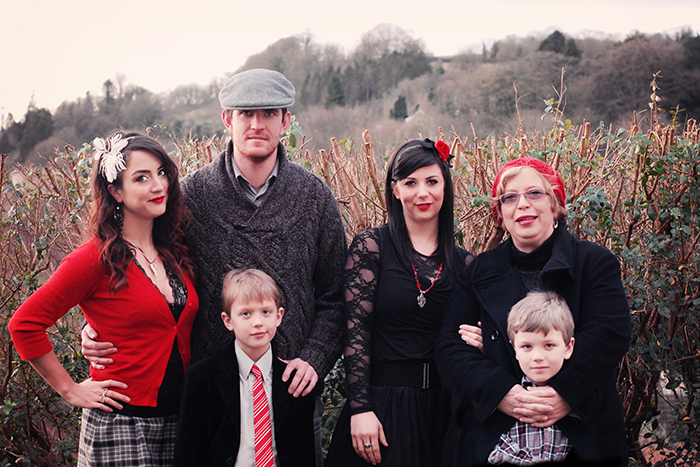 With my husband, our sons, my sister Zoë, and my mum aka 'Nonna' at Christmas when we moved to Bath, England. 1. Go back to school. Enroll yourself into school or sign up for a workshop. Sometimes all we need is a sense of direction. Perhaps this means embarking on a new career path or finishing a degree. Perhaps it is as simple as taking a night class for a new hobby you have always wanted to try. Even just trying something completely new to step out of your comfort zone can be the difference of wanting to runaway and finding your new path. My husband found his new path after the military by enrolling for a masters programme abroad in England. For me, now that we are here, I have wanted to take an adult ballet course or get back into horseback riding (a childhood passion I once enjoyed). The point is to expand your mind for learning and let the new opportunities and relationships that will occur from it take place. I work as a photographer but for a hobby I started taking weekly self portraits. 2. Read a Book. I love to read because it is within a book that you can transport yourself to a new world or reality. Tolkien has always been a favourite of mine since my dad used to read the Hobbit to me as a small girl. Now I like to escape to the top of Solsbury Hill (ref to the Peter Gabriel song) outside my back garden and read when I need an escape. Join GoodRead online to see what books your friends are reading or find a local book club that you can join. The latter could be a great way to meet new people as well. Sharing my love of Harry Potter by reading it to my boys. 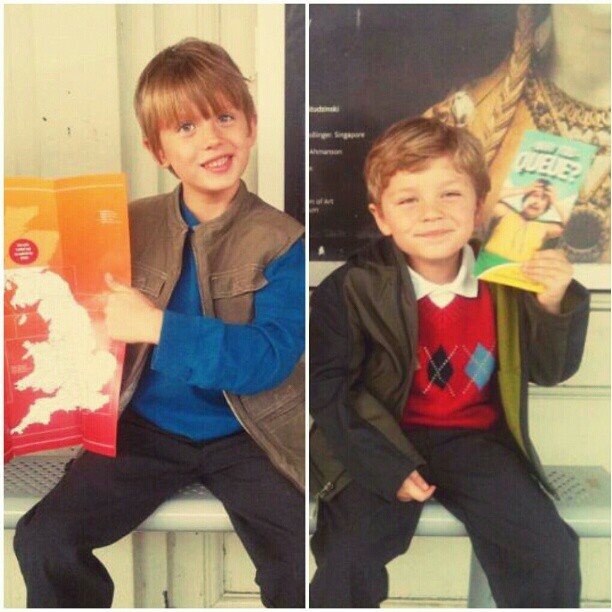 Their reward for each finished book is to see the film for the first time. 3. Learn a New Language. My only regret is not being fluent in another language. I moved to often and too frequently between countries of other languages to become fluent in the country. I have yet to stick with a language program to keep it up. I am always trying to go back to learning Italian and have high hopes for learning another three languages. For me the struggle is not having anyone with whom I can practice a new language. Join a class, club, or group where you can practice your language. Maybe find an online penpal through the blogging sphere that you can do language practice with through a Google Hangout. It might just inspire you on a new vacation where you can really put that language study into practice. By learning a new language you break down a barrier to be opened up to many more relationships. 4. Try a New Recipe. Whether you are a gourmet chef at heart or just try to not burn water when making pasta, you can find inspiration through cooking. I find the best part of cooking is being able to share it with others, so maybe plan a special dinner or host a small party. Find a country or a theme to prepare foods around. Maybe you once traveled to South East Asia and want to reminisce your trip. If you find yourself homesick, take a positive turn and learn to cook something new from your home's local cuisine. 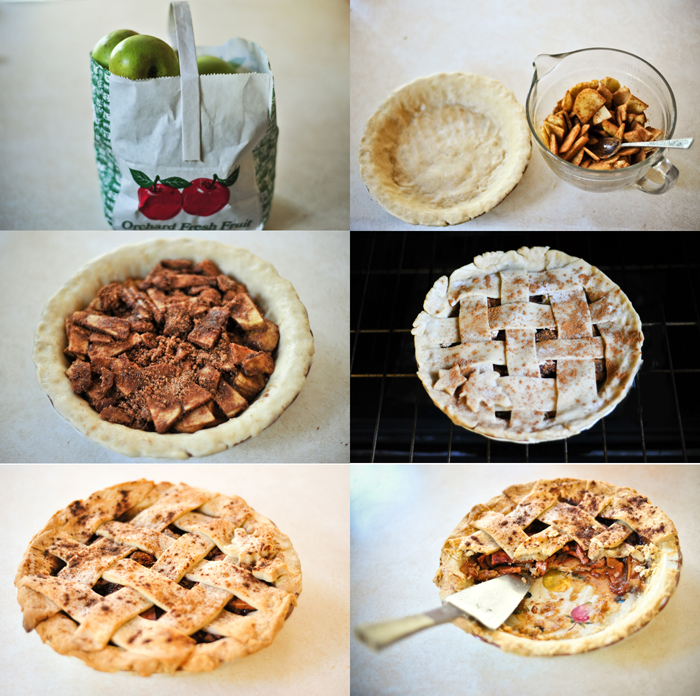 Last Autumn my BFF, though miles away, sent me her crust recipe and I made my first pie. 5. See your current location through new eyes. More specifically younger eyes. Whether you have your own kids or are friends with those younger and shorter beings, it can be a refreshing advantage point. I honestly would miss out on so much if I didn't talk to my kids about what they experience in life. I like to give my kids cameras and we will go out on a walk and take photographs. Being able to see our surroundings through their eyes (and their much shorter heights) always opens my mind and heart to more than what I would normally perceive. 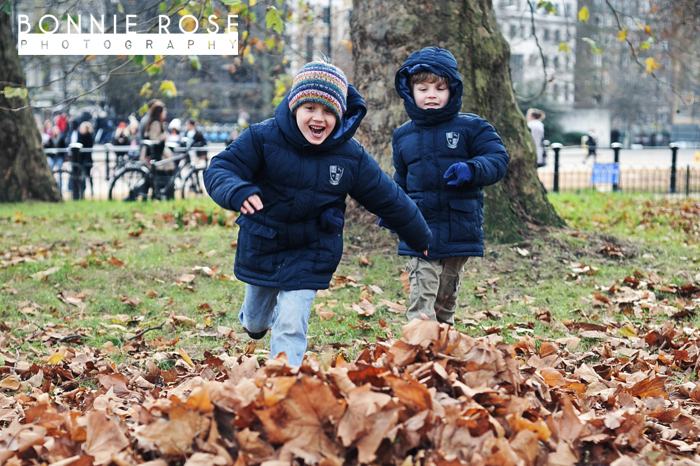 Normally I would walk past a pile of leaves, but when out with my kids in London it became a playground filled with laughter. 6. Play the Tourist. It is really easy to take things for granted when you live somewhere. The easiest way to see your current surroundings through a new light is to pretend like you are only just visiting for the first time. Grab a tour guide book or go on a bus tour of your city. Experience the places you have seen before and explore the places you have yet to see. Perhaps there is a new restaurant that you have yet to try out. Or that museum you have been meaning to check out, but have yet to go inside. Grab your camera and document your day out. My kids picked up local maps and guides from the rail station and we went off exploring. 7. Meet Somebody New. This is easier done when you are younger or enrolled in school. If you find yourself always at home or always around the same people, find a reason to meet new people. Perhaps you signed up for a lecture or a weekend wine tasting. Maybe you decided to volunteer in your local area. Maybe now is the time to finally meet your neighbours. However you go about it, make new friends with people and see how it opens your world view. 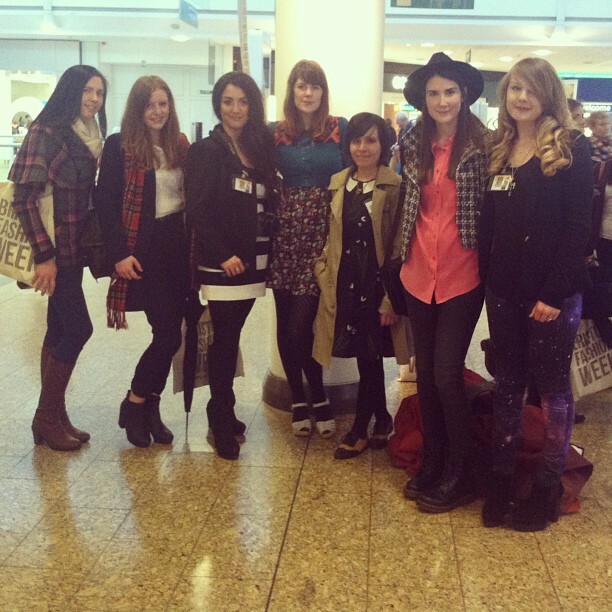 I (third from the left) attended a Live Blogging Show at Bristol Fashion Week and met new bloggers and friends. 8. Fall in Love. I have heard it said that if it was easy to fall in love, we would all be in love. However falling in love can make a place you felt lost in become a place refreshed with purpose and give you a reason to stay. Maybe you are already married and so you feel this option does not apply to you. There are many types of love and perhaps it is the right time to fall in love with a sweet animal from the shelter who needs a new home. Or maybe you find a way to fall in love with your current city. Life is filled with so much purposed when you surround yourself with love. It could be as easy as just ridding your life of toxicity to find the love that already exists. 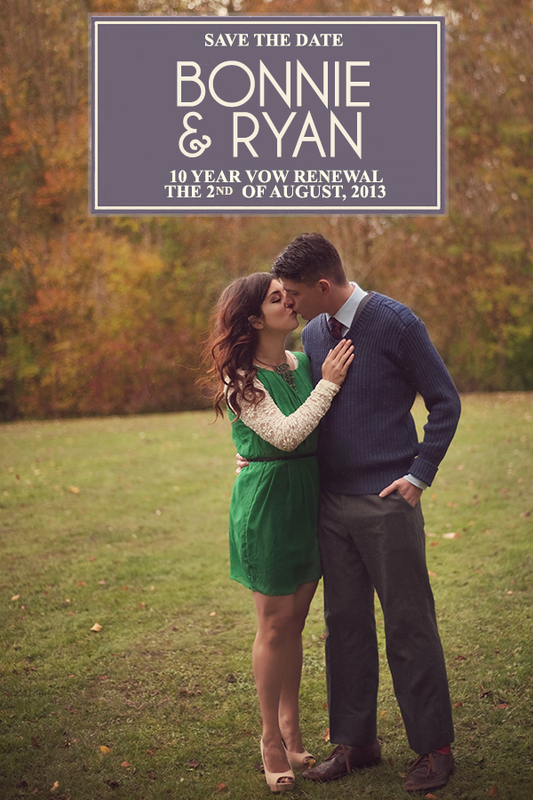 I found my happiness by falling in love with my husband all over again as we experience the new life as Expats. 9. Plan Ahead. Just because you do not need to move or travel far away at this moment does not mean you cannot plan. I get most excited about planning out my new adventures. Sometimes its just comforting to pull out my travel book from the shelf and read through different countries I would love to explore next. You could start a Pinterest board of places you would like to visit. Make lists of the things you would like to do or see in a certain area. Talk to other bloggers who live in places where you would love to visit. 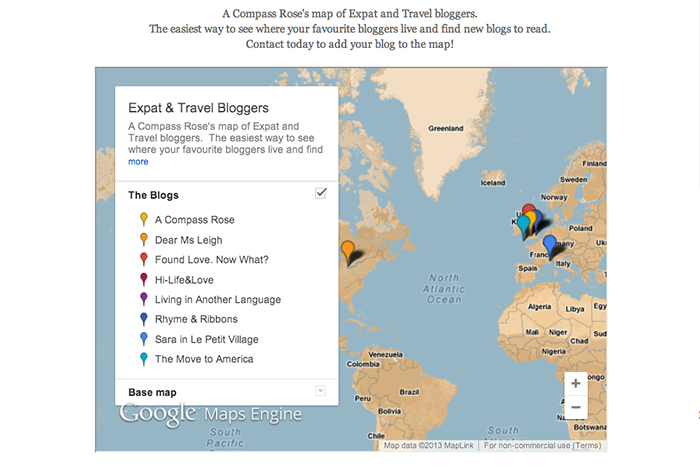 Visit my MAP of Expat and Travel bloggers to find those who live in certain countries and start following their journeys. 10. Go on a Mini Break. While the definitions of a mini break can vary from person to person given your means and time allowances, just getting a way for a little bit can help bring you focus. Perhaps you are a busy mum who can only just get one day off to be pampered at the spa. Or perhaps you are a couple who can escape to the mountains for the weekend. Whatever fits your lifestyle, find a way to get away from the normal day to day life to recharge your batteries. While living in Brighton we took a mini break to Lewes, where Anne of Cleaves had a house, and stayed at a luxurious B&B for our anniversary. I hope you have enjoyed my top ten ways you can help ward off restlessness and that it helps you fall in love all over again with your current location, with life, and with those special to you. This is a wonderful list, Bonnie! And I totally love the topic as it's something we all feel at some point. Thank you so much for taking the time to make this. Your commentary about regretting not learning another language is only more motivation for me to keep at it with my love/hate relationship with Japanese. Thank you for the inspiration! Some of these tips really spoke to me! Like playing the tourist. After three years of moving around, I'm now settled into the same Midwestern state as my boyfriend, albeit two hours apart. There's so much to do in my city, and I've made a point of trying to do as much of the free/cheap things as possible. For my upcoming birthday in June, my boyfriend and I are going just a few hours away to another big city to hit up all the museums, the zoo, and a pro baseball game. I fight not to be complacent and bored, especially since I'll probably in this state for several years. I took a writing class at Shakespeare & Co. in Paris when I was living/working in the suburbs as an au pair. I loved having a very different experience than just a tourist or a resident. It was also a great way for me to really reflect on how much I had changed since moving to France, which came out through my writing. I'm mostly fluent in French, but I really want to perfect my skills. This post is a nice reminder that I need to find a French conversation group here. :) Maybe once I'm done with that, I can finally learn Norwegian! Learn Norwegian...that would be ace! I hope you can find people to speak French with too. I really think thats whats missing in learning and keeping up languages is the practical use of it. Great tips! Love the idea of seeing a place with new eyes - kids are so good for that!! They see and explore an area that I take for granted (cause I grew up in it) and I can see it through their eyes!